These shortcuts were introduced with the Publisher ribbon. Some tabs are contextual and appear only when you’ve inserted or selected an object such as a shape or a table. The double-letter shortcuts make it possible to use keyboard shortcuts with contextual tabs. To use these, first selected the object, then press Alt, press the two letter context menu shortcut, and then press the remaining keys if any. 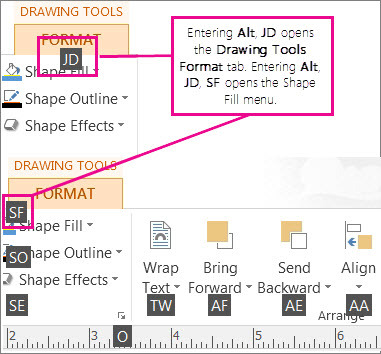 For example to open the Shape Effects menu and add a shadow to a shape you select the shape, press Alt, JD to open the Drawing Tools – Format tab, SE to open the Shape Effects menu, S to select the Shadow Gallery, and then tab through the shadow options to apply the shadow to your shape. If your publication is in Two-Page Spread view, these commands apply to the selected two-page spread. Otherwise, these apply only to the selected page. Display the Go To Page dialog box. Switch between the current page and the master page. Turn Boundaries on or off. These keyboard shortcuts are available when you're in Print view and affect the print preview pane. Open the Print dialog view. After you choose Send as Message (File > Share > Email), you can use the following keyboard shortcuts. Important: Outlook needs to be open before you can send email messages. If Outlook isn't open, the message will be stored in your Outbox folder. Display the Macros dialog box.